Chiropractic Healthcare is an understanding that the alignment of the spine affects the nervous system in a major way. The spine is home to the spinal cord and the nerves extending from the brain to the body and back. It is crucial that this flow is uninhibited and able to carry messages that affect how out bodies function. The best part about Chiropractic Healthcare is its drug-free and surgery-free approach. It has been shown to improve (reduce) back pain, headaches, neck pain, arthritis and joint pains, and scoliosis. It helps to lower blood pressure, encourages a healthier and easier pregnancy, improves organ function, and reduces the need for surgery. A vertebral subluxation occurs when the spine inhibit proper motion or are in a position to negatively affect communication between the brain and the rest of your body. Vertebra refers to your spine, sub means less, and luxation means dislocation. Many things can lead to a vertebral subluxation. A few include a vertebra being misaligned due to a slip and fall or car accident, osteoporosis, poor posture, joint swelling due to damage, and degenerative changes of the spine. Before considering back surgery, many surgeons will refer their patients for chiropractic care as an alternate source for pain alleviation. At Elite Sports Medicine, we work with pain management specialists and several surgeons to create the right treatment plan for our patients. 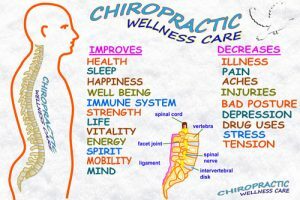 The nervous system controls every cell and organ in the body; chiropractic physicians focus their attention on the health of your spine being properly aligned and, if there are shifts, helping the spine come back into alignment.